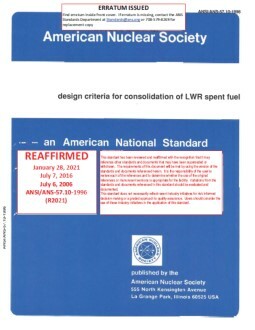 This standard provides design criteria for the process of consolidating light water reactor spent nuclear fuel in either a wet or dry environment. The process utilizes the equipment and systems used to perform consolidation, handle fuel rods and nonfuel-bearing components as well as handle broken fuel rods. This standard also contains requirements for facility or installation interfaces, nuclear safety, structural design, thermal design, accountability, safeguards, decommissioning, and quality assurance. The standard is not concerned with the storage of the spent fuel either before or after the consolidation process.